Therapy Recycle + Exorcise is a sustainable fashion brand run by sisters Mariangeles and Paula Aguirre. They collect vintage pieces from flea markets and charity shops and turn them into a whole new collection. You might have seen them at some markets and fairs in Berlin, and most recently at the REUSE:it show at the Berlin Alternative Fashion Week (BAFW). Lola Who sat down with the sister duo to talk about their experience at the BAFW, what they want to change in the fashion industry and the differences between Berlin and Argentina. 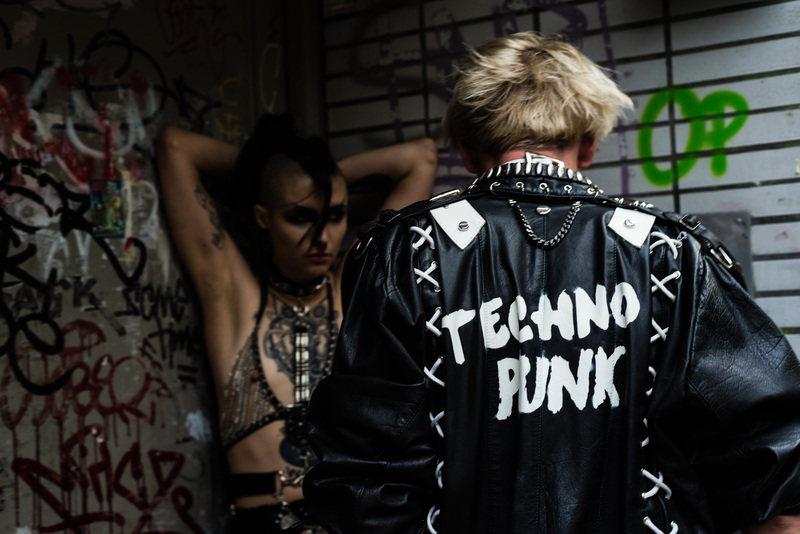 Lola Who: This October was your third time taking part in the Berlin Alternative Fashion Week. How did the latest edition differ from the previous ones? Mariangeles: The March BAFW was great, there was a lot of media coverage. This time, the reaction is a bit slower, but we got a lot of comments and positive feedback. When you sell things at the market, you get the chance to talk to people. Many came up to us and said: I saw your last show and this was even better. It was great to hear that our show was powerful and full of energy. It was a “real show” in comparison to standard fashion shows with only models. And it was fun for everyone involved, which is what we want to do with Therapy. We want to have fun. Lola Who: You originally started making and re-making clothes for yourselves. When and how did this evolve into starting a brand? Mariangeles: We come from a small city in Argentina where there were never many things available in the shops, especially back in the 90s. Buying stuff was also very expensive, that’s why people were making things themselves. We always had a sewing machine at home. Our grandmother was a professional sewer, and she used to make clothes for us. Our third sister was also sewing her own clothesit’s something that has always been present in the family. Paula studied fashion design and although my studies were not related to fashion, I was always doing things with my hands too. I had a jewelry brand when I was at university and Paula was making accessories and clothing. We were experimenting a lot, with plastic and bright colours… It was very alternative. In 2004 I moved to Germany and it took me years to settle in and learn the language, but at some point, I felt the need to do something creative. In 2012, I had a bit of a crisis after having turned thirty; I had questions in my mind regarding my identity as an immigrant in Germany and as a person in a broader sense. All these years I’ve been collecting vintage pieces that I found at flea markets because I didn’t like the things that I saw in shops. But I didn’t want to simply re-sell what I collected, I don’t think that’s fun. So it all came together when I started sewing again, adding things or changing something on the clothes I already owned, and selling those things in markets. Then, I asked Paula to make a logo and she made the Therapy logo that we’re still usingthe one with the cross. What we’re doing is a kind of therapyit’s a creative therapy. Through that I am also healing myself in a way, exorcising everything bad in my life by turning into something new and better. Therefore: Therapy Recycle + Exorcise. Paula: My sister told me about the idea through Skype after I did the logo, and I agreed that we should do it together. Ten years earlier, we were running these two brands in Cordoba, and it was a lot of fun, it was very creative. And we love working together. When Mariangeles came to Argentina in the summer she brought bags full of Therapy things she had madeand she sold everything. People seemed to like it because it was something different, a new idea, nobody was doing that in Argentina. We didn’t know what was gonna happen, but we did it. We can work separately, split between Berlin and Argentina, and we work together when Mariangeles comes here. It was a natural process. Lola Who: There are so many positive things about using and reusing clothes the way you guys do. What do you think is stopping people from thinking and acting the same? Is it them being lazy, the time pressure, lack of interest, or maybe lack of information? Mariangeles: In Argentina in the 90s, it was not so easy to buy stuff. Things have changed, and now you can have everything quickly and for cheap. People think: Finally, I can go and buy things, they don’t think that buying is a bad thing. I understand their point of view; imagine working a lot and not being able to buy things, that’s not a nice way of living. It’s fair that now people can buy what they want for the money they’ve earned, but at the same time, I think brands can be abusing. Recently I’ve noticed that people have more information and that’s a good thing, that’s the first step. Once you have information, you can start analyzing things and be more critical. At some point, you need to make a decision whether you want to wear something that was produced in poor working conditions, or even by children, because if you do you are also supporting the system that allows this. Personally, I know I would feel awful if I wore something cheap from a discount brand. I would feel the contradiction and it would feel as if I was lying to myself. But I also understand that people don’t think about it that way. Paula: You cannot talk about the negative things regarding fast fashion all the time. With our project, we’re coming from the positive side. We’re trying to show that it’s possible to do things differently instead of telling people that fast fashion is bad and making them feel guilty. If you have a shirt and you don’t like the buttons, just change the buttons. Try to see if you can do something out of it before you throw it away and buy a new item. That’s the first step, but people need to realize that, they have to see themselves doing it. It’s not impossible, it’s not difficult, you just need to try… (laughs). Lola Who: Can you tell me about an event or action you organized to encourage people to try it for themselves? Lola Who: How did your style develop under the influence of the vintage pieces? Mariangeles: The brand started as a sort of research about my own identity. Looking at pictures of myself now, I see that I used to dress differently. I was never conservative and I always liked to experiment. But with Therapy, I became more aware of how strong is the power of what you communicate through the clothes you wear. Lola Who: As a fashion brand, you are necessarily a part of the fashion industry, yet at the same time, with your concept you are fighting against it. What is the position of sustainable fashion brands within fashion industry?Paula: I don’t hate fashion, I like fashion. We are not against fashion, we are against the processes that contaminate the fashion industry, against doing things the wrong way. To me, fashion is a means of self-expression, a way of communication, a form of art. I admire a lot of designers; Vivienne Westwood, Alexander McQueen, Chanel, they came up with amazing things. But what we are against, is making fashion the wrong way. Mariangeles: I think Vivienne Westwood is a good example of how you can change things from within the industry. I think many brands are now realizing that if they don’t start doing things the right way, they are going to stay behind. Fashion is the second most polluting industry in the world, you cannot keep concentrating on the profit and not consider the future of the planet at all. But everything is more transparent now, people ask for more information. I believe things are changing for the better. I’m positive. Lola Who: What’s your plan for the nearest future? Mariangeles: The next big thing in our calendar is the Berlin Fashion Week happening in mid-January. Next year, we want to focus on new stuff. We don’t want to keep repeating ourselves, we’re always looking for new challenges. Paula: At the fashion week in Argentina there’s no space for brands like Therapy. They focus on big brands and well-known designers. Instead, I am concentrating on production, sales, and running our two stores here. Now there is a new store asking to sell our brand, so things are happening! When Mariangeles comes to Argentina during winter in Berlin, and when I go to Berlin during the winter in Argentina, we do things together, such as showrooms and things that are fun. We don’t want to see Therapy as work, even though it’s a lot of workit has to be fun!